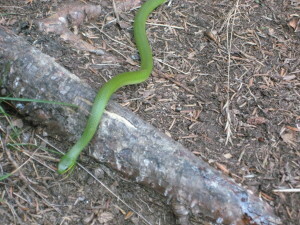 This lovely snake is not a viper, far from it–a more harmless and gentle little creature never lived. 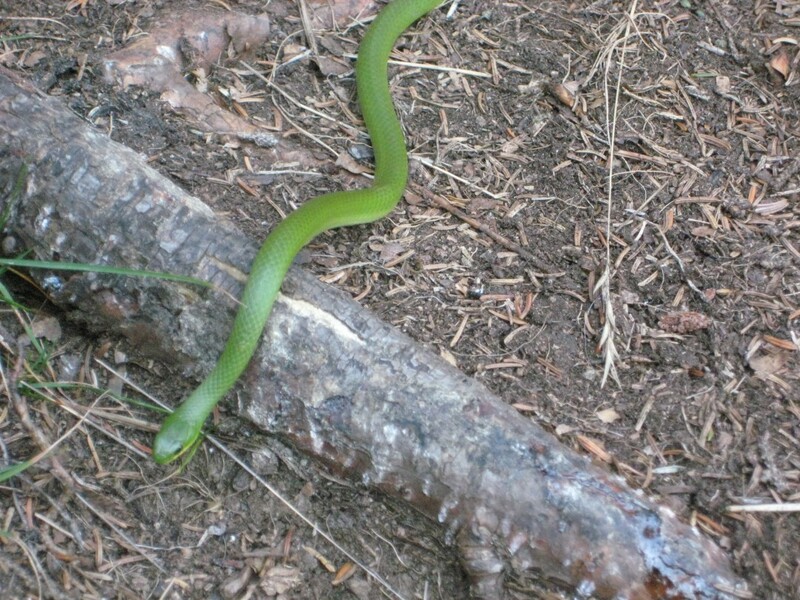 It’s a grass snake, also known as a green snake, who crossed my path on a hiking trail in New Brunswick, and obligingly posed for photographs before melting into the ferns on the side of the trail. 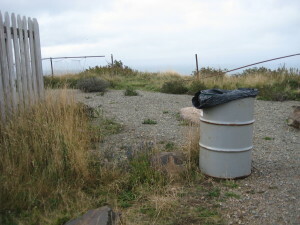 Funny, when I parked the car at the trailhead, I noticed a beautiful blue plant lurking next to the garbage can–viper’s bugloss. A strange name. It’s a Eurasian import, and “Bugloss” has ancient Greek roots meaning ox tongue, which probably refers to the rough, tongue-shaped leaves. “Viper” because the stem is speckled like a viper (the speckled band?) and also the seeds are very slightly shaped like a snake’s head. Old superstition says that a plant that looks like something is effective for that purpose–kidney-shaped leaves are good medicine for kidneys, etc. Viper’s bugloss has long been known as a folk remedy for snakebite. 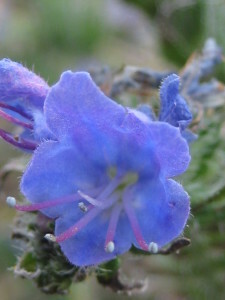 Nicholas Culpeper, a seventeenth-century herbalist, explained that viper’s bugloss “is an especial remedy against the biting of the Viper, and all other venomous beasts, or serpents; as also against poison, or poisonous herbs.” However, he adds that “Dioscorides and others say, That whosoever shall take of the herb or root before they be bitten, shall not be hurt by the poison of any serpent.” So it has to be used as medicine before you’re bitten–afterwards, sorry, you’re out of luck. Better plan ahead. However, John Gerarde, a sixteenth century herbalist, claimed that just the sight of a viper’s bugloss flower is enough to cause snakes to flee. Clearly it doesn’t work, however, since I almost immediately bumped into my little green friend here. But since grass snakes are completely non-poisonous, maybe the viper’s plant doesn’t work on them.